We’re certainly a family that likes to travel and explore together. We’ve packed so many times that even the girls are experts at packing their own suitcases. No matter how many times we’ve traveled, each and every time a plush friend or stuffed animal has joined us on our journeys. Create a cute travel carrier for your kids to bring along their cuddly friends on your family vacation. There’s something comforting for kids when they have a cuddly friend along for the trip, helping them explore new places and deal with a variety of emotions. Perhaps they’ll be amazed, confused, tired, sad, or jumping for joy at the places and things they experience. Whatever their emotions might be, having that plush friend to hug and cuddle up with on planes and strange beds helps make the experience a little less frightening. 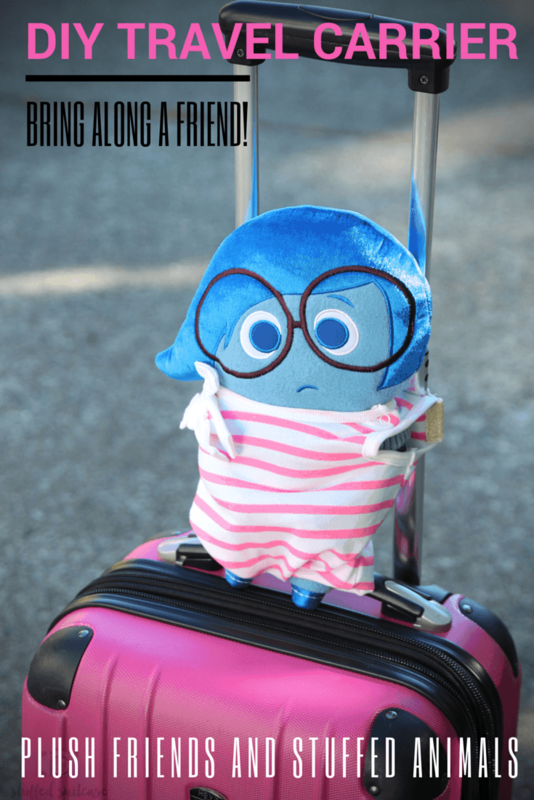 One problem that many families face with this need to have a plush friend or stuffed animal along for the ride is transportation. We’ve probably all heard the stories of sweet cuddlies left on planes or in distant hotel rooms. 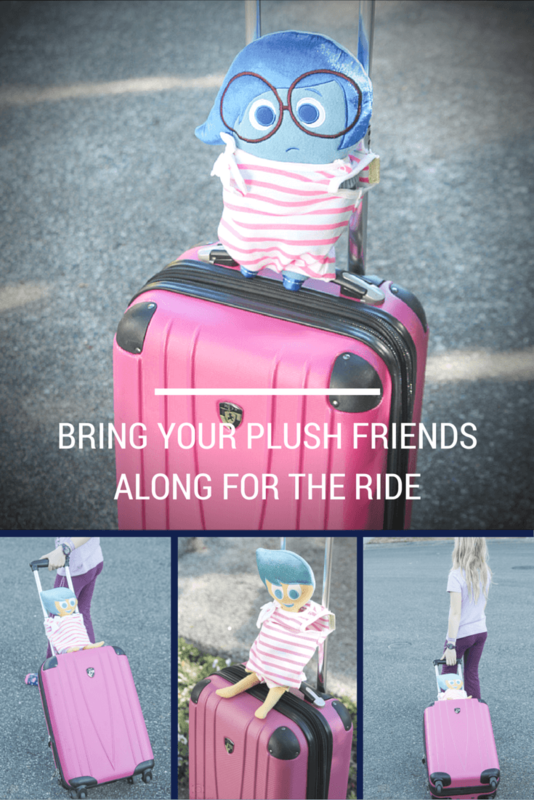 So, I created this simple DIY travel carrier for kids to use to hold their plush friends or stuffed animals as they travel. Having a special carrier for their friend will help them be sure their friend is strapped in to go whenever it’s time to move on. 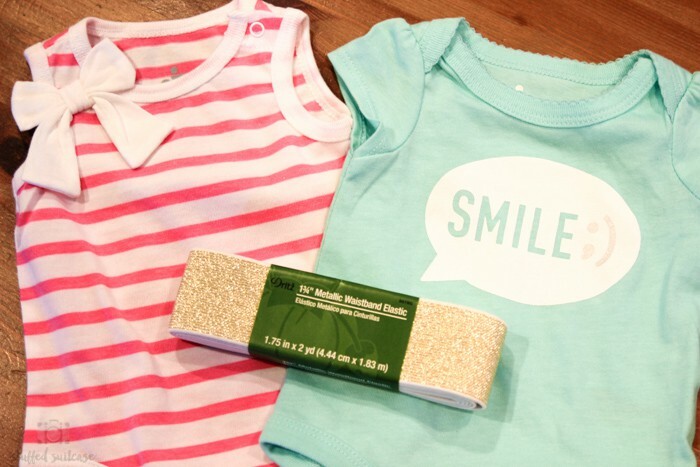 Let’s get started on how to create this fun DIY travel carrier. You’ll want to buy a onesie – whatever style you prefer. I bought newborn size, but you’ll need to determine the best size based on your plush friend. You also need to buy some thick elastic. 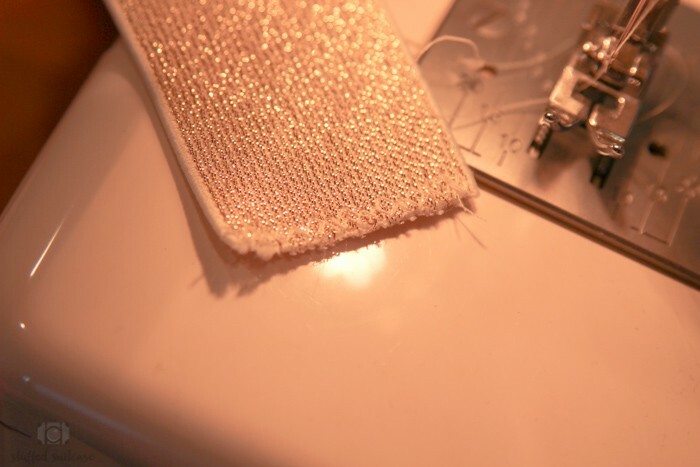 This gold metallic elastic was purchased at Joann and is 1.75″ wide. 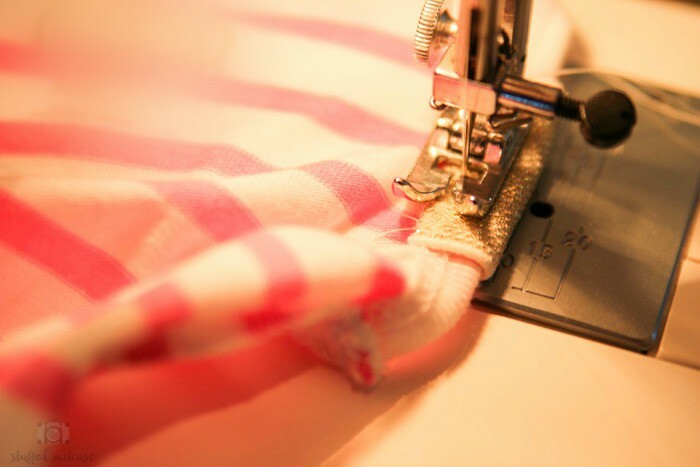 Having a sleeveless onesie is helpful as it makes it easy to wrap and sew on the elastic. 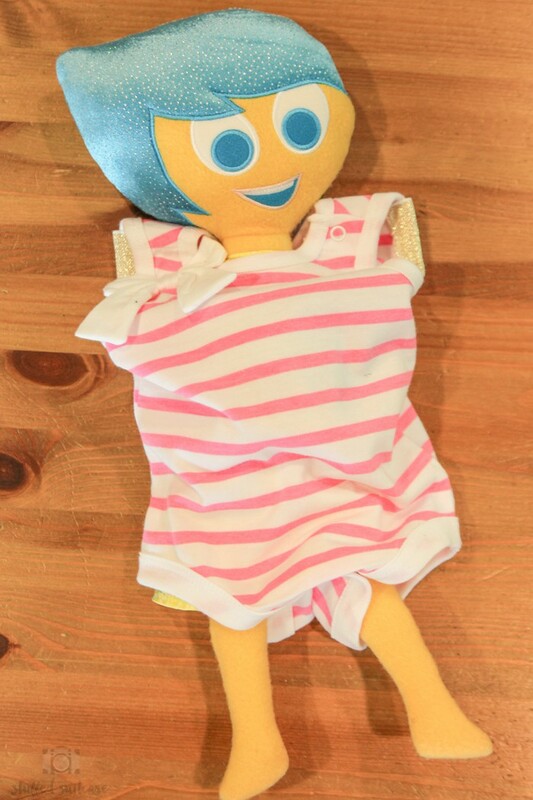 Turn the onesie inside out and measure a strip of elastic that is longer than the distance of the arm holes. You can see here that I allowed enough extra elastic on each side to wrap around the arm hole to the back. I added a few lengths of zigzag stitching to each end of the elastic to help prevent fraying. Note that the onesie is turned inside out and the elastic is passing through the middle of the onesie. Then wrap the elastic around the armhole and stitch (layers are elastic, onesie, elastic). I did a skinny rectangle stitch so I ran down one edge, across the small top/bottom of the elastic, back up the opposite edge, then across again. 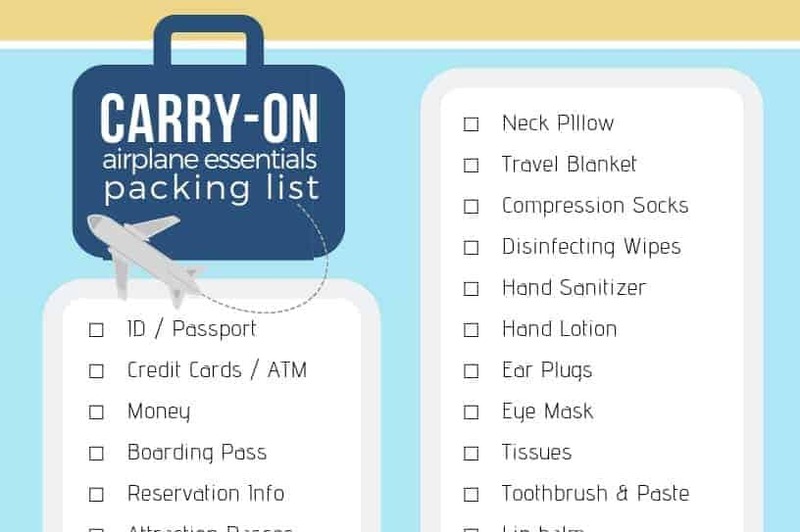 Be sure to back stitch and reinforce, since the elastic will be pulled and stretched over the suitcase handle. Both sides are finished and you can see the rectangle stitch a bit in this photo. 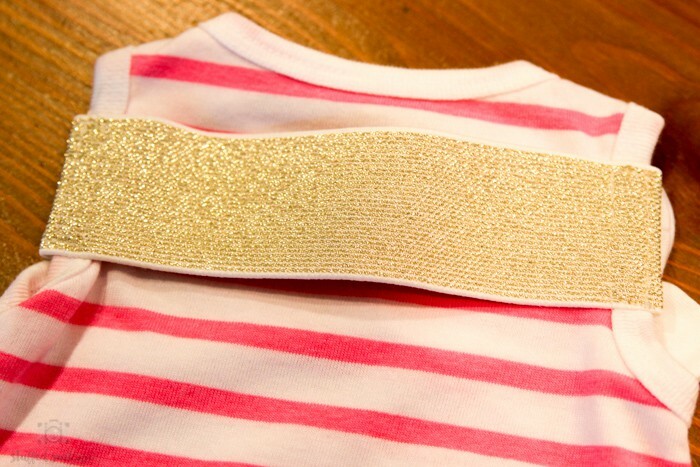 Turn the onesie right side out and you’ll be left with a strip of elastic running across the back of the onesie. 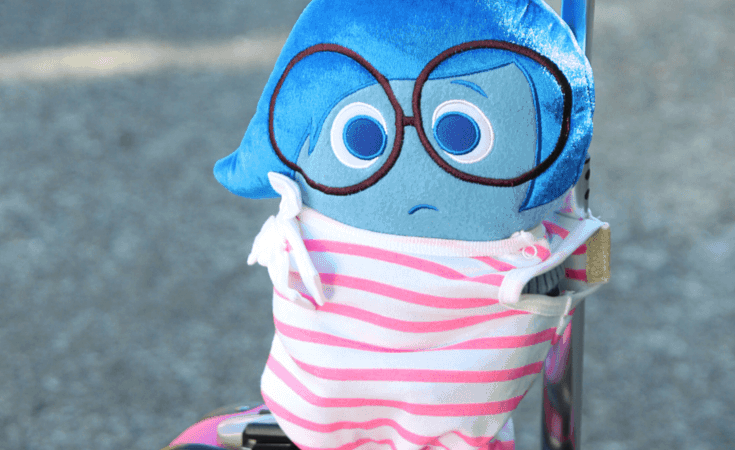 Add your favorite plush friend, like Joy from Inside Out, and you’re almost done! 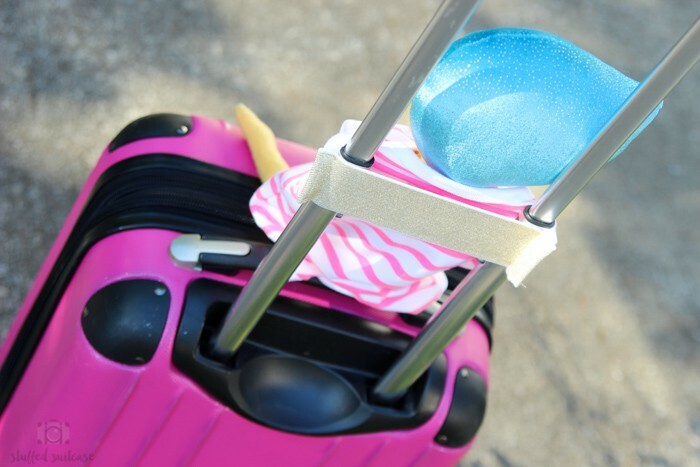 All that’s left is to slide the elastic over the handle of your suitcase, and your child now has a special spot to tote their cuddly friend along for their travels, hopefully sharing lots of joy along the way! Love the cute plushes I used in the in this post? 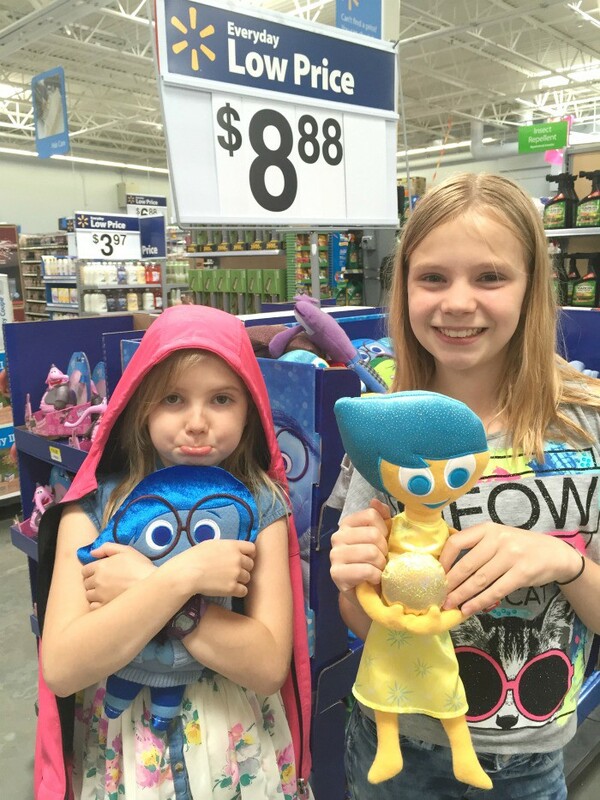 You can pick up your own sweet, cuddly Inside Out emotions at Walmart. My girls had a lot of fun creating facial expressions to match the characters. We came home with Joy and Sadness, which emotional character would you pick? Kids love to bring their cuddly confidant along on family vacations!